The ScoreBox® is an easily portable self contained and highly user configurable on screen score system. With a simple but powerful user interface, the ScoreBox® can be configured to display any look and feel for a users style. The ScoreBox® supports Basketball, Baseball, Football, Soccer, Hockey, Volleyball and Wrestling, other sports can be added upon request. The Scorebox® optionally displays sponsor logos for "sold scoreboard" sales. 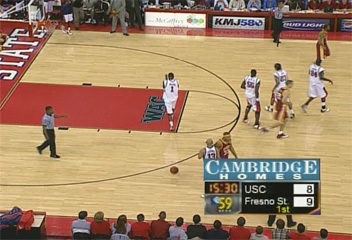 A user configurable DVE allows placement of such items as a shot clock on screen, freeing the TD from tying up more resources on the switcher. The other scores feature allows on screen updates of other games being played.